Clean your car with amazing snow foam! 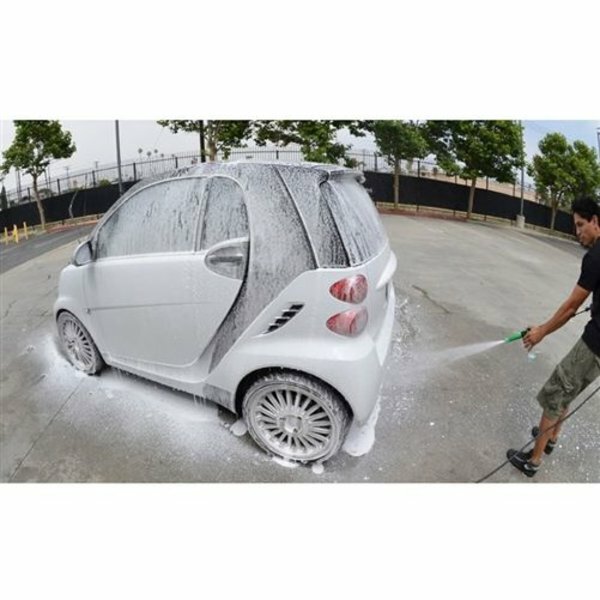 Honeydew Snow Foam is the first auto shampoo specifically designed to create copious amounts of cleaning suds in a foam cannon or foam gun. Use Honeydew Snow Foam for a touchless wash on your garage queen show car, or as part of your two-bucket wash on your winter warrior covered in salt, mud, and muck. Traditional wash methods push dirt around on painted surfaces, inducing scratches and marring marks that rob your car of shine. Using Honeydew Snow Foam in a foam gun or foam cannon during your car wash drastically reduces the chances of scratching your car as you wash, and adds tons of fun to the process! The new Honeydew Snow Foam is thicker, slicker, and more gentle than ever before. Powerful hyper surfactants cut through dirt and grime, lift them from sensitive automotive paintwork with billions of scrubbing bubbles, then safely lubricate and guide them off the paint for a scratch-free wash. The pH-neutral formula is gentle on wax coatings, and safe to use in direct sunlight for a spot-free wash. Turn every Sunday morning car wash into a foam party with Chemical Guys Honeydew Snow Foam. 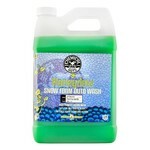 Honeydew Snow Foam is gentle and surface safe so it can clean any area of your vehicle from wheels to paintwork. The pH-balanced formula even allows you to wash your car or truck in direct sunlight. Honeydew Snow Foam rinses clean every time with no residue for a clean surface that will grab attention. The high level of foam produced by Honeydew Snow Foam makes this high-tech detailing shampoo perfect for foam cannons and foam guns. 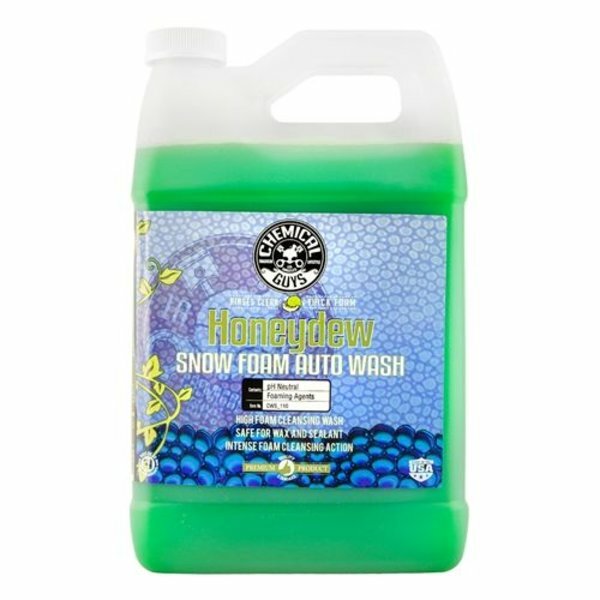 Honeydew Snow Foam Auto Wash was released to total acclaim from customers and critics alike, but we 've taken your comments and suggestions and reformulated Honeydew Snow Foam to make it even better. Growing is what we do and growth relies on innovation and education. For the past 10 years we 've taken notes and listened to your feedback on how we can make the products even better. Our products have traveled worldwide and have been applied to millions of vehicles and we are proud to say that the results were exceptional. Improving an already amazing product involves reengineering, redeveloping, and manufacturing a product that excels above even our own expectations. The secret to The secret to Honeydew Snow Foam 's high performance detailing capabilities is in the chemistry. Chemical Guys believes in utilizing the most advanced technology to give professionals and enthusiasts the best detailing experience possible. Improper washing and drying causes scratches and swirl marks that dull paintwork. In order to take Honeydew Snow Foam to the next level, our chemists developed premium super polymers and hypersurfactants that release dirt, dust, and debris allowing them to simply be rinsed away for a scratch-free wash. The unique formula of Honeydew Snow Foam is engineered with water softeners that reduce hard water spots caused by calcium. The premium super polymers inside Honeydew Snow Foam allow you to wash any surface safely, maintaining that show-winning shine. Use Honeydew in your two-bucket wash and with a foam cannon or foam gun for ultimate versatility. Honeydew Snow Foam takes your weekly wash to the next level of perfection! Chemical Guys believes that versatility gives you an advantage in any detailing situation, and Honeydew Snow Foam Auto Wash is the perfect wash shampoo to tackle any detailing job. The pH-balanced formula is designed to work on any color paintwork, on any exterior automotive material, and in shade or direct sunlight. The unique formula leaves any surface clean and free of dirt and road grime. Use Honeydew Snow Foam in your weekly 2-bucket wash for a streak-free shine that is truly impressive. Want extra foam? Use Honeydew Snow Foam Auto Wash with our Chemical Guys TORQ foam cannon for a deep cleaning foam party! Maintaining your vehicle 's protective wax or sealant layer is important: wax and sealant protect your car from UV rays, contamination, and water spots. Honeydew Snow Foam maintains your protective wax or sealant layer. The unique washing formula washes away dirt, grime, and filth, and will not strip your protective layer. Honeydew Snow Foam washes all exterior surfaces with precision. Simply mix 1 ounce of Honeydew Snow Foam to 5 gallons of water to create a superior surface cleanser with a generous amount of wash suds. The advanced super polymers glide over your current wax or sealant layer ensuring that your car, truck, motorcycle, or RV stays protected against the elements. Honeydew Snow Foam will show you the true definition of clean. When you are done washing your car and ready to dry it, use AfterWash to not only speed the drying process, but also moisturize your paint. 95% of swirls and scratches come from poor wash and drying habits. The advanced lubricating polymers in After Wash glide any premium microfiber towel over paintwork for a scratch-free shine. After Wash is available in 4 ounce, 16 ounce, and gallon sizes. Honeydew Snow Foam Cleanser is available in 4 ounce, 16 ounce, and 64 ounce (1/2 gallon) sizes.